NASA's Fermi Gamma-ray Space Telescope has discovered 12 new gamma-ray-only pulsars and has detected gamma-ray pulses from 18 others. The finds are transforming our understanding of how these stellar cinders work. "We know of 1,800 pulsars, but until Fermi we saw only little wisps of energy from all but a handful of them," says Roger Romani of Stanford University, Calif. "Now, for dozens of pulsars, we're seeing the actual power of these machines." A pulsar is a rapidly spinning and highly magnetized neutron star, the crushed core left behind when a massive sun explodes. Most were found through their pulses at radio wavelengths, which are thought to be caused by narrow, lighthouse-like beams emanating from the star's magnetic poles. If the magnetic poles and the star's spin axis don't align exactly, the spinning pulsar sweeps the beams across the sky. Radio telescopes on Earth detect a signal if one of those beams happens to swing our way. Unfortunately, any census of pulsars is automatically biased because we only see those whose beams sweep past Earth. "That has colored our understanding of neutron stars for 40 years," Romani says. The radio beams are easy to detect, but they represent only a few parts per million of a pulsar's total power. Its gamma rays, on the other hand, account for 10 percent or more. "For the first time, Fermi is giving us an independent look at what heavy stars do," he adds. Pulsars are phenomenal cosmic dynamos. Through processes not fully understood, a pulsar's intense electric and magnetic fields and rapid spin accelerate particles to speeds near that of light. Gamma rays let astronomers glimpse the particle accelerator's heart. "We used to think the gamma rays emerged near the neutron star's surface from the polar cap, where the radio beams form," says Alice Harding of NASA's Goddard Space Flight Center in Greenbelt, Md. 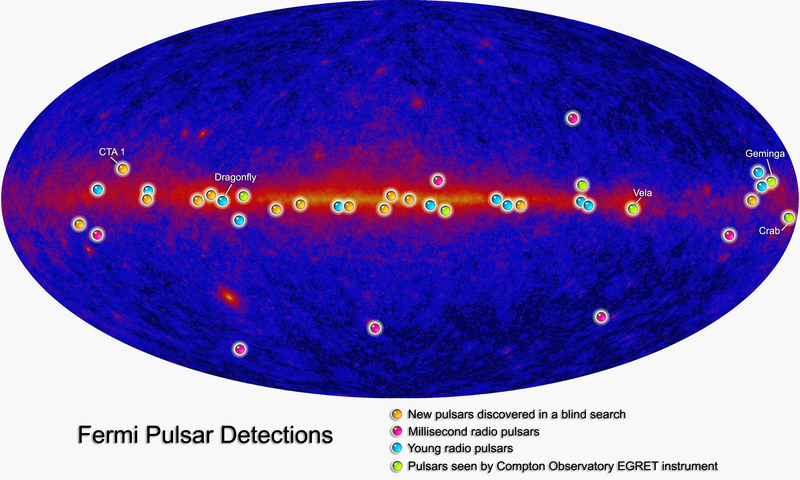 "The new gamma-ray-only pulsars put that idea to rest." She and Romani spoke today at the American Astronomical Society meeting in Long Beach, Calif.
Astronomers now believe the pulsed gamma rays arise far above the neutron star. Particles produce gamma rays as they accelerate along arcs of open magnetic field. For the Vela pulsar, the brightest persistent gamma-ray source in the sky, the emission region is thought to lie about 300 miles from the star, which is only 20 miles across. Existing models place the gamma-ray emission along the boundary between open and closed magnetic field lines. One version starts at high altitudes; the other implies emission from the star's surface all the way out. "So far, Fermi observations to date cannot distinguish which of these models is correct," Harding says. Because rotation powers their emissions, isolated pulsars slow as they age. The 10,000-year-old CTA 1 pulsar, which the Fermi team announced in October, slows by about a second every 87,000 years. Fermi also picked up pulsed gamma rays from seven millisecond pulsars, so called because they spin between 100 and 1,000 times a second. Far older than pulsars like Vela and CTA 1, these seemingly paradoxical objects get to break the rules by residing in binary systems containing a normal star. Stellar matter accreted from the companion can spin up the pulsar until its surface moves at an appreciable fraction of light speed. NASA’s Fermi Gamma-ray Space Telescope is an astrophysics and particle physics partnership, developed in collaboration with the U.S. Department of Energy, along with important contributions from academic institutions and partners in France, Germany, Italy, Japan, Sweden and the United States.